SOME 2,408 PEOPLE were on trolleys this week according to the Irish Nurses and Midwives Organisation. This marks an increase of 221, or 10%, on the same period last year. Nursing representatives from the INMO met with HSE officials earlier today to see how hospital overcrowding can be reduced. 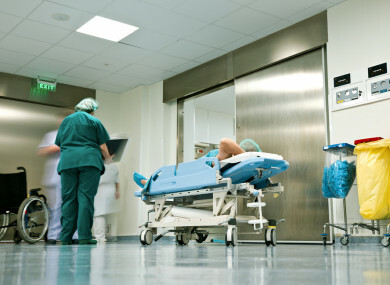 The organisation is calling for a mandatory de-escalation policy where full capacity protocol has been implemented, by the HSE, in all acute hospitals – to avoid overcrowding spreading throughout hospitals and to reduce the risk of cross infection, poor patient outcomes and burnout amongst staff. Speaking today, INMO General Secretary Phil Ni Sheaghdha said, “This morning’s meeting was productive. We now have a clear focus on implementing patient flow measures, agreed as part of the INMO/HSE January 2016 WRC Agreement. This agreement was designed to improve hospital overcrowding and where it has been implemented fully the results demonstrate significant improvement. The Emergency Department Taskforce will meet on Monday to set out immediate, medium and long-term practical approaches to the current recurring problem of hospital overcrowding. Email “More than 2,400 people on trolleys in first week of 2018”. Feedback on “More than 2,400 people on trolleys in first week of 2018”.